There's plenty of interest in the beta, but Activision says the more the merrier. For all the complaining you see about Call of Duty Elite, Activision's new service for its wildly popular FPS games, on internet forums, a lot of people seem to be excited - or at least curious - about it. Activision's Dan Amrich has announced that registrations for the service's beta have hit two million people in less than two weeks. Writing on his blog, Amrich said that the Elite beta would be a "live" beta, and the data and feedback that players generate when it goes live on July 14th would have a real bearing on the final form of the service. He also said that despite the large numbers, people should keep applying for the beta. Two million people was actually only a small portion of Call of Duty's 30 million strong audience, he said, and more people in the beta would be even better. Activision unveiled the service late last month. Elite adds a whole host of social elements to the games, such as user groups and custom leaderboards, and detailed player statistics. There will also be optional premium elements which will require a subscription, although, other than the downloadable map packs, Activision hasn't been forthcoming with what they will be. 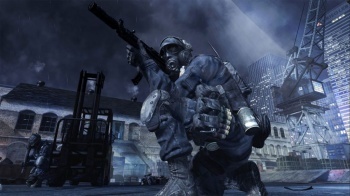 Call of Duty Elite launches on October 8th, alongside Modern Warfare 3.